Aston Aunties, taking part in their first ever GAME National Championships, find their way to the grand finals to face the Cambridge Memers. The journey hasn’t been easy but the ambitious team from Aston University have shown that you don’t need pedigree to be one of the best. Matty Triceps started the season in the support role. This changed however when Andy ‘Ȃndy’ Moore joined the team which moved Matty to the top lane. Tending to play safer laners with a team fight oriented style Matty is instrumental in the team’s strong team fights. I don’t think its too crazy to suggest that J3T is one of, if not the best jungler in the NUEL. His ability to play a wide variety of champions and consistently providing ward coverage and map pressure is a large component to the success of the team. J3T had a fantastic semi finals going 9/5/35 against UoB TCA Storm which is an astounding score considering the strength of the UoB squad. Widely perceived as the star of the team MSR has garnered some notoriety amongst the players and casters. With frequent use of his mastery emote and extreme confidence he has established himself as quite the character. He does however have ‘the skills to pay the bills’. As the team’s primary carry he utilises his mastery of Kalista to dominate team fights and dish out enormous amounts of damage. The other half of the terrifying Kalista/Alistar bot lane, Ȃndy’s job (much like Wood League) is to provide initial engage for the team and to keep MSR alive. With a very strong performance on Alistair in the semifinals I look forward to seeing how Cambridge will deal with this powerful combination. With the division of the country into regions it seemed a given that University of Birmingham would achieve the top spot in the Midlands. Their place was stolen by an entirely new team from Aston University, the Aston Aunties. Following their success in the qualifiers Aston had a strong first season maintaining top 4 until they faced Huddersfield White in the mid season finals. They would win the series to take the title of mid season champions. Heading into the next split the Aunties show they didn’t slack off during Christmas and maintain their top spot which rewarded them with an automatic placement into the semifinals to face the second seed of the Wildcard Tournament. The team to face them would be one they had played many times throughout the season. University of Birmingham TCA Storm traded wins with the Aston Aunties multiple times in the regular season, and they did so again in the semi finals. In an exciting best of 3 that showcased the talent from both teams Aston emerged victorious with a 2/1 record. This may be reassuring to Cambridge as the loss shows that in their current form you can take a game off the Aunties. The Aston Aunties have been top of the points table for the majority of the season with a fantastic record against the other top teams. Tomorrow we will find out if the Cambridge Memers have what it takes to take 3 games and win the grand finals. 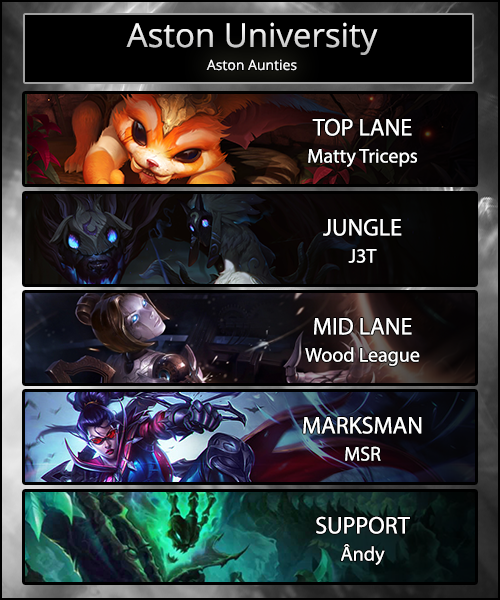 To catch the momentous games be sure to head over to twitch.tv/theNUEL tomorrow at 15:00 where the Aston Aunties will face the Cambridge Memers to decide the winners of the GAME National Championship.